Believe it or not, it’s really hard to keep a closet dust free. Most of us just organize the closet and maybe clean it out once a season, but dust accumulates quickly on clothing and valuables if a storage space is not dusted properly or regularly. 1. Clean the closet to get it entirely dust-free. Sorry, but before you can keep your closet dust-free, it needs to BE dust-free. 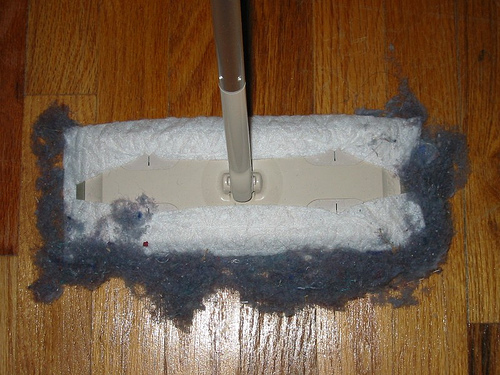 Take everything out and use a Swiffer duster or whatever your preferred product to remove dust, hair, dirt and whatever else might have made its way in there. 2. Use a lint roller on every piece of clothing you own before putting it back in the closet. Repeat whenever putting an article of clothing back in without washing it first, especially if you have a furry pet. 3. Don’t let anything sit in there for too long. If you have to let something sit for a while like a winter coat or a tuxedo, cover it up with a dry cleaner bag or a clean trash bag. 4. Keep the floor of the closet clean. Not only with this lessen dust build-up but it will only take a few moments to vacuum once the dust does begin to accumulate. 5. Febreze your closet regularly or leave an air-freshener inside. This won’t actually help with the dust, but it will keep your clothes smelling fresh. Do you have any other ideas for keeping a closet dust free? Leave a comment and let us know or tell us on twitter via @ContempoSpace. This entry was posted in Closet, Furniture, Home and tagged cleaning tips, Closet, dust, swiffer. Bookmark the permalink.